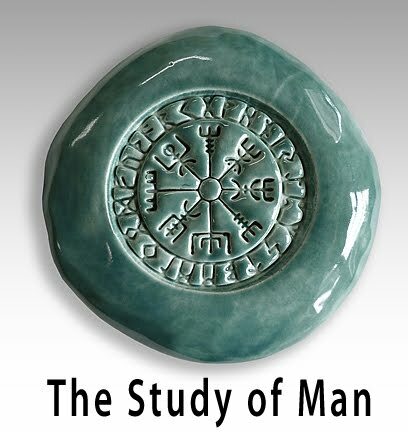 I started on a new project this week. 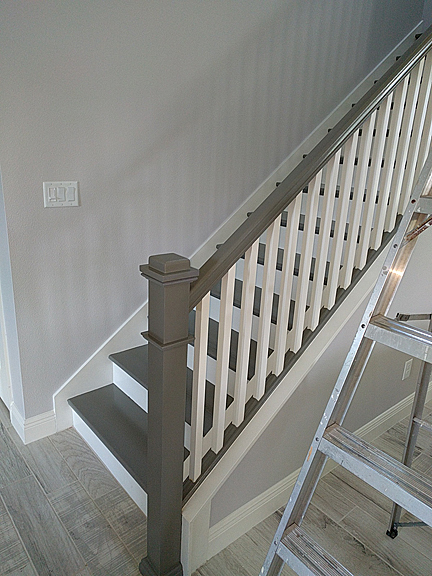 The job is to paint a set of stairs and the hand railings to look like wood in a new home. There are 12 stair treads a landing and then 6 more treads, plus the handrails. When the home was built the home owners had a really beautiful driftwood tile floor installed. It's amazing how they can make tile look like real wood now. You really can't tell the difference. Anyway the builder was suppose to make the stairs and railings look like driftwood too. So the first two pictures are what happened. 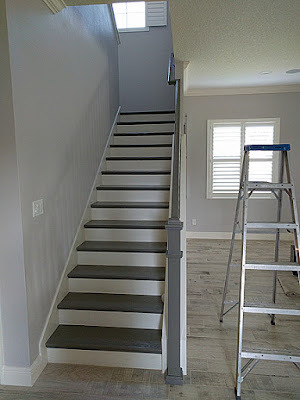 The stairs ended up being painted a battleship gray. Not even close to a driftwood look. The home owners where not pleased at all. 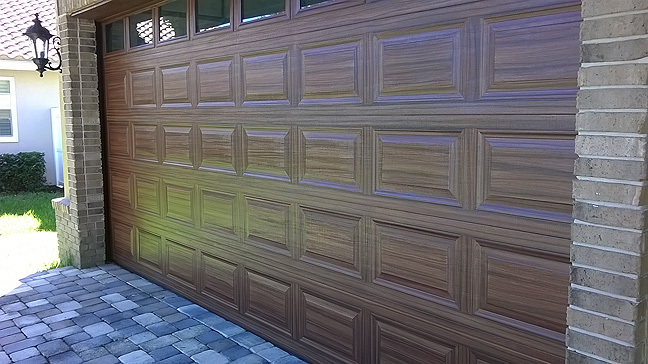 I was called in to consult and see if I could create a look that would be more what the homeowner wanted. I did 4 sample boards, for homeowners, 2 where driftwood and 2 where an espresso wood look. I made the sample boards the right size so we could lay them on top of the stair treads to get a great idea of what the stairs would like. Taking into consideration the rest of the decor in the room and existing flooring the espresso look was the obvious choice. Painting them to look like the existing floor just seemed too much. So as with all painting projects the first thing I do is clean the stairs really well. After all people are walking up and down them they are dirty. Then I scuff sanded them down and primed with a gray primer. Taping off each stair tread and the balusters took a long time but it's was the only way to insure I didn't get the paint all over the white trim and the risers. 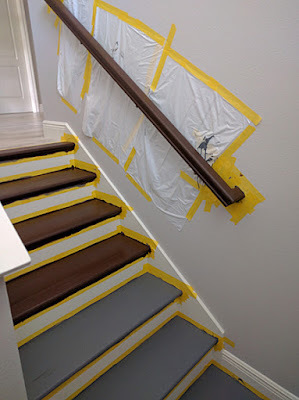 I taped plastic bags behind the rails so I wouldn't get paint on the walls. Once I had it all taped off I applied the base coat of paint, a dark brown. 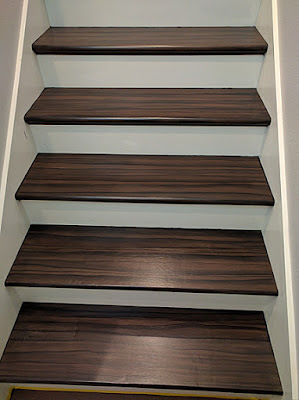 After the base coat dried (the next day) I could start to create the espresso wood grain look on the stair treads and railings. 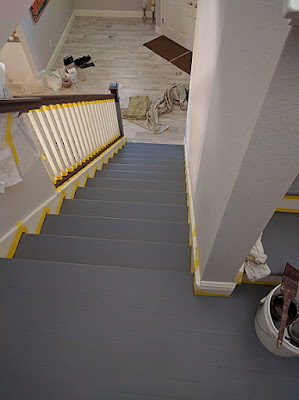 The thing about working on the stairs is you can't walk up the stairs until the paint dries really well. Even so, once I started I took off my shoes and I am working in my socks. So you go up 12 steps to the landing and turn go up 6 more to the second floor. I have the top 6 stair treads done and the railings. I am going to apply 4 coats of a crystal clear floor finish on them. The next picture is the top 6 treads with 2 coats of the clear over them. The treads are actually a little darker than the picture indicates. What color paint and products did u use ? After sanding the stair threads I primed with a dark grey primer. 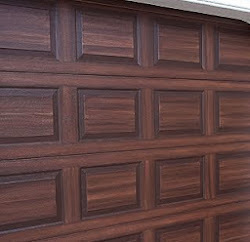 Then the base coat is a Sherwin Williams color called Turkish Coffee, the grain lines are SW tricorn black. You have to be careful with the black or it will look too dark so I thinned it down with water some. Then I applied 4 coats of a clear floor finish over it. I used a waterbourne product called Varathane Floor finish. Hope this helps.